Today is the first day of school. I mentioned last week that there are a few things I’m worried about regarding the start of school and I thought I’d share a bit more about those things today. Yes this may be a bit of a whine fest, but let’s get it out in the open! This is my chart before I filled it in. And then I changed it a bunch of times. Basically, Simon has school from 9-12:30 and I am driving and picking him up every day. Almost every day I will also be driving his friends either to school or back or both. Gabbie and Zachary start school at 7:55 and thankfully they have a ride to school every day. For pick ups, Zachary gets out every day at 3:40 (except Fridays when it’s 2:50) and Gabbie gets out later than Zachary on Mondays and Wednesdays. So some days they both have a ride home, some days I pick them up, some days I pick one of them up and not the other, etc. It definitely gets confusing! We send lunch daily at our schools and we must send dairy or vegetarian lunches. 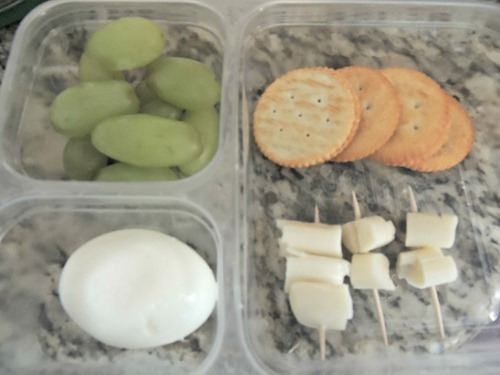 I was going to post a round up of Bento Box lunch ideas but I couldn’t find enough that I liked! So I’ll just show you the lunches my kids are eating today. 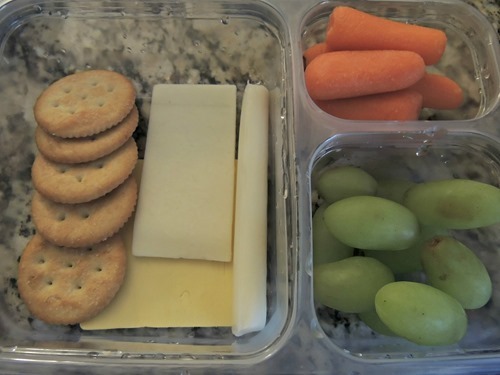 Simon’s lunch includes carrots, grapes, cheese, and crackers. He is generally the easiest of my kids to feed because he likes almost everything! This is Gabbie’s lunch. She started liking eggs lately and this way I have a protein to give her! She made the cheese toothpicks herself! I feel like this one needs a bit more color. 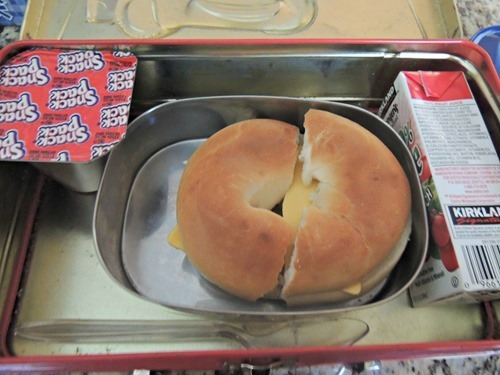 Zachary’s lunch is the least Bento-like because the only thing he eats is bagels with cheese – for breakfast and for lunch! He also gets the unhealthy pudding and juice box. I don’t think he likes any healthy foods at all. Apples, berries, carrots, cheese, crackers, craisins, cucumbers, eggs, grapes, kiwi, mini muffins, peanut butter, pickles, and pretzels. Like I mentioned Gabbie and Zachary start school at 7:55 each morning. The problem is that most of us have been sleeping until 8 AM this summer! To be honest, I think the kids will be fine waking up earlier, it’s myself that I’m worried about! Today I am driving them to school, which also means getting Simon ready an hour earlier than I’d normally have to. So, I guess you can wish us (me) luck. With the failure that was completion of summer homework, I am hoping and praying that the kids will be ok with daily assignments coming home! I have heard Gabbie will get a lot as a 3rd grader and I know Zachary will have more than he did in kindergarten. 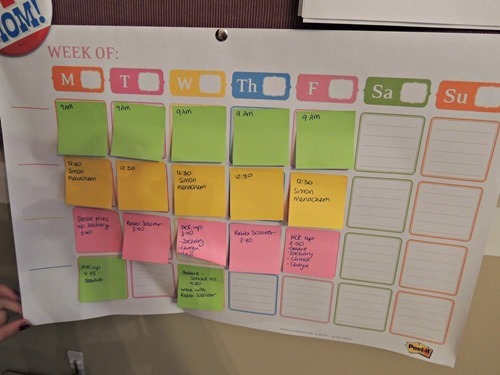 Their rule is to do their homework as soon as they get home, but there are days when Gabbie won’t be home until after 5 PM (on Wednesdays, when dance starts, she won’t be home till after 6). By the time school gets going, I’m sure these things will work out and fall into routine! For now, I still feel worried! How about you? By the way, does the new header look blurry to you? I’m not sure if I should try again or leave it how it is!